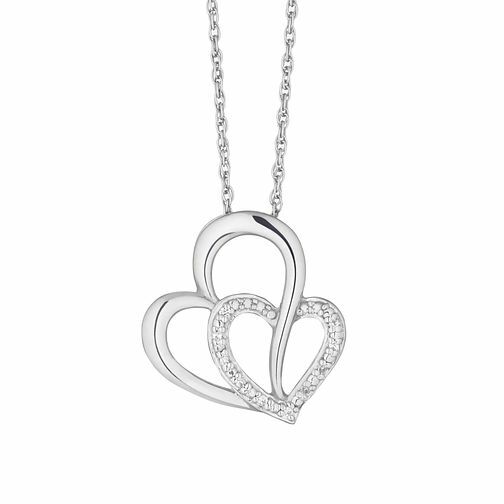 A stunning and sentimental silver pendant, placing two interlocking hearts with diamond embellishment set to shimmer and shine upon a fine silver chain. A cute and elegant design, perfect for gifting to a loved one. The total diamond weight of this necklace is 0.02ct. Silver Diamond Heart Pendant is rated 4.3 out of 5 by 81. Rated 5 out of 5 by Anonymous from Nice pendant, everything I expected Purchased for my girlfriend's 18th and she loved it, pendant itself is a nice size and weight, has a nice quality feel and diamonds add a lovely sparkle, would highly recommend. Rated 5 out of 5 by Anonymous from Lovely Bought for my cousins birthday, and she was really pleased. Beautiful item and a good size. Delighted!